Picture this: it's a Monday morning. You wake up and lazily gaze at the clock – "Oh no!!" you think to yourself, "I completely overslept! "Jumping out of bed and rushing through your morning routine, you come to the sad realisation that you won't have time to make both coffee and breakfast – you'll have to choose. Caffeination or nutrition. This is an impossible situation that I hope none of you, dear readers, ever need to face. Luckily, I've got your back. Today's recipe will ensure that this never happens to you. The solution? Putting the coffee inside the breakfast, of course! These are everything you would expect from a classic bran muffin, but they also include 2 packets of instant coffee and some cocoa powder for a delicious mocha flavour and a caffeine kick to boot. 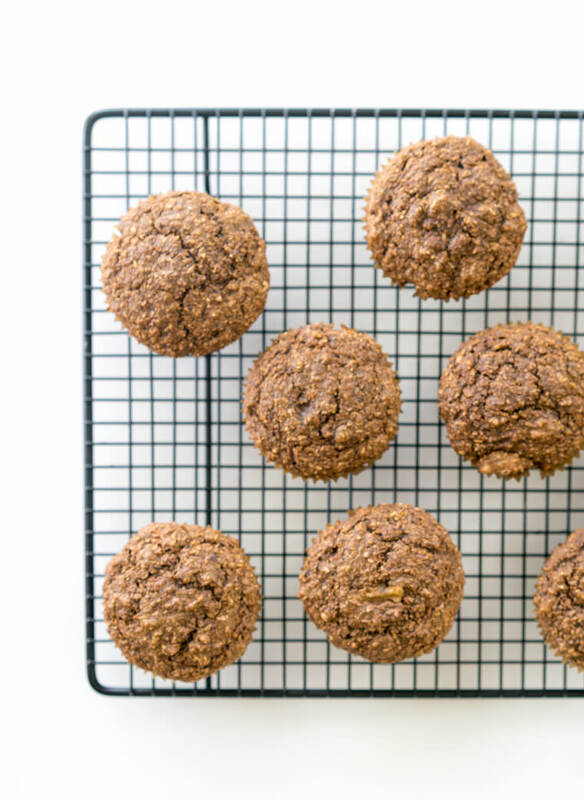 Mocha-Infused Bran Muffins – a whole new way to enjoy coffee and breakfast. Start by preparing a cup of non-dairy milk with half a teaspoon of apple cider vinegar to create instant vegan buttermilk. Let this sit for 2-3 minutes, then add the wheat bran right into the buttermilk so that it absorbs most of the liquid and softens. Let this sit for 5-10 minutes. Also, add a tablespoon of ground flaxseed to a small dish with 2 tablespoons of water to make a flax "egg". Let this sit for 5 minutes to thicken. In a mixing bowl, add the wet ingredients: coconut oil, apple sauce, turbinado sugar, flax egg, and vanilla. Soften this in the microwave (or a saucepan) for about 20-30 seconds and whisk until the sugar is dissolved. Note: These muffins are only mildly sweet. If you'd prefer them to be sweeter, add 1/2 cup of sugar instead of 1/3 cup. In a separate mixing bowl, combine the dry ingredients: all-purpose flour, cocoa powder, Starbucks Via, baking soda, baking powder, and salt. Whisk or sift this together. Finally, combine everything in this order: 1) Add the bran/buttermilk mixture into the wet ingredients and stir until smooth. 2) Add these wet ingredients into the dry and *gently* combine (overmixing will make the muffins tough). 3) Add in some walnuts or other throw-ins like chocolate chips (you didn't hear that from me…). Transfer evenly between 10-12 cupcake papers lining a muffin pan and bake at 375º F until a toothpick comes out clean (about 15-20 minutes). Optionally dust the tops with sifted cocoa powder for fun, and serve.